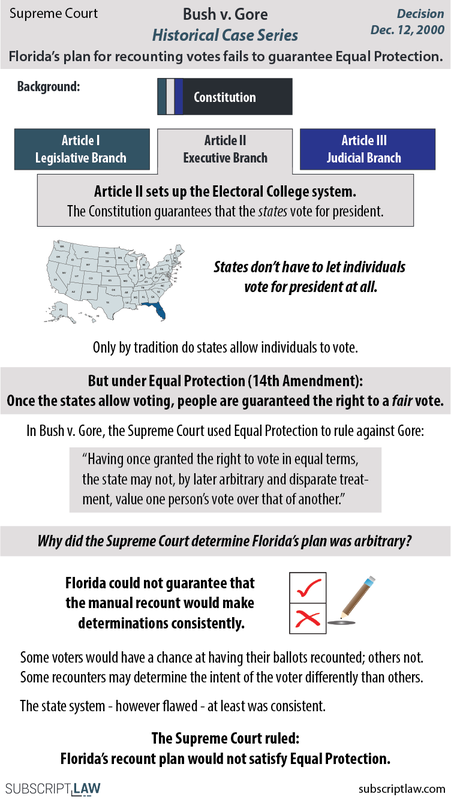 On December 12, 2000, the Supreme Court ruled that Florida's plan for recounting votes for the 2000 Presidential election was unconstitutional. Equal protection is a commonly cited provision of the Constitution when it comes to voting rights. Bush v. Gore was one of the most controversial Equal Protection - voting rights rulings. The Court decided that the Florida plan outlined an unequal/inconsistent method of recounting votes - a violation of the Equal Protection clause. One proposition the Court notes in this case that may come as a surprise: States do not have to allow individuals to vote for president. This comes from the Constitution's setup of the Electoral College system. Our infographic explains how the decision rests on the proposition. Critics have noted that state elections across the country have similarly inconsistent methods. The Supreme Court noted that the Bush v. Gore ruling should be limited to the specific case (limited value as precedent). The Court's decision to limit the Bush v. Gore ruling from making precedent on the Equal Protection analysis marks a potential contrast with a case of this term. In Gill v. Whitford (decision forthcoming) the Supreme Court will decide whether to get involved in a partisan gerrymandering case. Democrats claim the Wisconsin state legislature drew voting lines unfairly to keep Republicans in power. The biggest issue in Gill v. Whitford is whether the Court will rule the case nonjusticiable. See our case explainer to learn about "nonjusticiability," but the gist is that the Court may not rule on an issue if the Court can't set a precedential standard from it. Put another way, the issue is too complicated to set strict lines. In a 2004 case, the Supreme Court ruled the Equal Protection analysis in a partisan gerrymandering case nonjusticiable (to difficult to set standards for). The Democrat voters are afraid the Court will follow the 2004 case (Vieth v. Jubelirer). If the Court does so, the Republican district lines will stand. However, Bush v. Gore shows the Court has another option. "Our consideration is limited to the present circumstances, for the problem of equal protection in election processes generally presents many complexities." It will be interesting to see whether the Court will avoid the issue in Gill v. Whitford, knowing it has another option, like the one it used in Bush v. Gore. For see other important rulings on Equal Protection and voting rights, see this easy to read report from University of Missouri-Kansas City.